Aquascape Koi Krunchies are ideal for hand feeding koi - providing an excellent addition to the regular diet of your fish. This nutritious treat contains high-quality ingredients and natural citrus flavors, making them irresistible to pond fish. 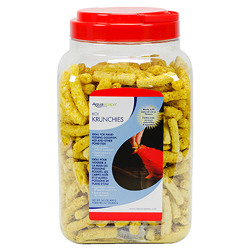 The size, shape, and taste of the Krunchies make them a perfect tool for training your fish hand-feed, often a difficult task for pond owners. A great source of vitamin C, Aquascape Koi Krunchies aid in proper tissue formation, digestion, and disease resistance. Crude Protein 16% min. Crude Fat 1.8% min. Crude Fiber 2.0% max. Moisture 9% max. Crude Ash 3% max. Phosphorous 0.2% min.